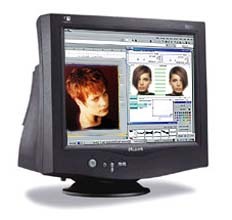 "VirSal" (Virtual Salon) - is a special place for the longhaired Ladies, who are thinking of going short. Here you can see yourself with the short haircut just before your dating with the stylist. Then, you can agree or not with seeing your long locks on the floor of the Beauty Salon. If you want such a virtual makeover, drop me a line. Dear Ladies, clients of the "Vir Sal"! Please don't forget to send me your new styles photos & comments about your virtual & real haircuts.